God clothes the lilies. He decorates flowers that live more weeks with colors that inspire. The flowers don’t have souls; they don’t have minds to think. they are fleeting. yet God sees to their needs. 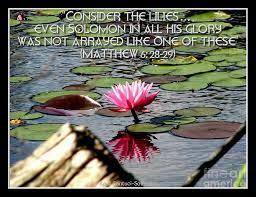 God is aware of what a lily needs, and He provides for it. Not only does He provide, but He provides lavishly and all flowers including lilies blossom with His beauty. Verse 28: “And why do you worry about clothes? Learn how wildflowers of the field grow; they don’t labor or spin thread”. We are Gods’ most precious treasure, the ones He loves so dearly that He gave up His Son. He knows our needs too, and He provides for us, all He has for us lavishly. God clothed the flowers in His Creation, and we are created in His image, how much more does He want to look after our needs, if we let Him. We request not because Our Lord and Our Friend doesn’t know our needs, but so that we can recognize Him when He answers, and He always will. Paul in his writings to the Philippians encourages them to stand firm in the Lord, by rejoicing in Him always, presenting Him with their every need and trusting that He will take care of them. Faith is a doing, a doing of trusting, so consider The Lilies, and reflect, we are far more important to Him. Prayer is communication with Our Lord and Our Friend, that knows all about us, let all communicate with Him more.